What’s happening to volatility, and why does it matter? This question seems to pop up now more often now. Volatility, as measured by standard deviation (SD), is currently at historic lows. The reasons for that are subject to much debate by market watchers. In practical terms, however, there’s another potential impact that we in the fund risk-rating business are watching closely: The CSA’s new fund risk classification methodology, which is based largely on standard deviation. It’s here that current low volatility levels could affect funds’ risk ratings going forward. At Fundata, we do a lot of work on risk ratings for various investment products, and volatility (measured by standard deviation) is integral regardless of the investment vehicle or risk rating methodology. Whether or not it should be integral is debatable, but the arguments in favour of using volatility are easy: It’s becoming more widely understood and accepted by market participants, and it does a reasonable job of illustrating the extent to which the price of your investment has fluctuated in the past. Standard deviation is a fairly simple concept, measuring the percentage amount by which a fund’s return varies from its expected average historic return (this is also referred to as a fund’s “volatility”). The higher the percentage, the wider the variance from the average, and the higher the risk that you could lose (or make) more money. For these and other reasons, standard deviation has become the basis of the CSA’s risk classification methodology that comes into effect on Sept. 1. So what’s happening to volatility? To answer simply, we are in a period of historic lows. 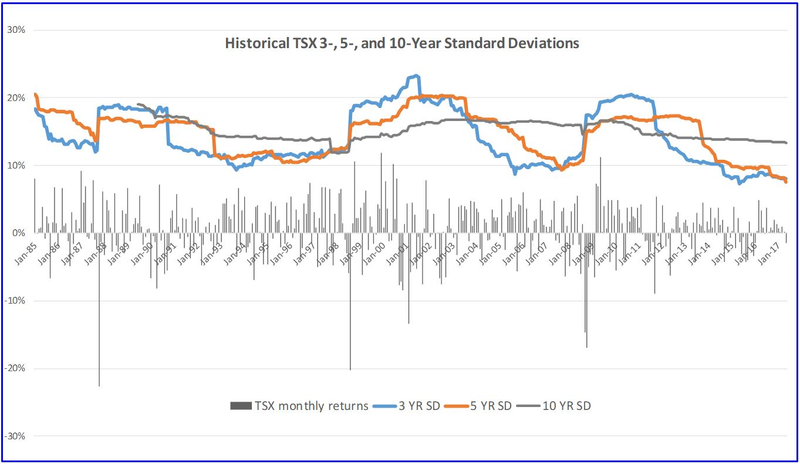 The accompanying graph shows the 3-, 5-, and 10-year standard deviations of the TSX since 1985, with the monthly returns indicated across the bottom. My colleague Brian Bridger wrote a great piece about what happens if volatility stays low for the next couple years, and what that means for risk ratings. However, I’m going to focus on the 3- and 5-year periods, to try to explain what they’re telling us about the current state of the market and ultimately what that means for risk ratings. At the time of writing in mid-June 2017, 5-year standard deviation for the TSX hit a new low, at 7.6%, while the 3-year standard deviation is at 8.1%, very close to the 7.3% low it set in May 2015. As you can see on the graph, this is just the second time that the 3- and 5-year standard deviations have been below 10% at the same time, the other being during the incredible bull market leading up to the financial crisis of 2008. Currently, the difference between the 5- and the 10-year SD is 5.8 percentage points, which is the widest the gap has been since 2007 when it got to 6.5%. All this to say that chances are we’re not going to experience another financial crisis-type event, but a spike in volatility seems inevitable at this point. One of the main arguments against using standard deviation exclusively is that it’s backward looking. Using historical volatilities doesn’t paint a holistic picture of risks going forward. This problem is compounded by the fact that volatility comes in waves and is very much mean-reverting. In a general sense, this makes volatility somewhat predictable in that you know that when it’s unusually low, there likely is a spike coming, and when it’s high, a retreat is in the cards. This is dangerous when you have risk ratings dependent on historical data. If a fund company does a calculation on its standard deviations at the end of June, for example, the data might be telling it to lower the risk rating, even though neither fund’s investment methodology nor risk exposure has changed. In fact, you could easily show that when the volatility of the fund is at its lowest, it faces its greatest risk for a price change, meaning when the SD drops, it’s actually the worst time to lower the risk rating. Between May 2015 and May 2016, 35 funds lowered their risk ratings. Between 2016 and 2017, 65 funds have lowered their ratings, while 10 funds have raised their ratings. 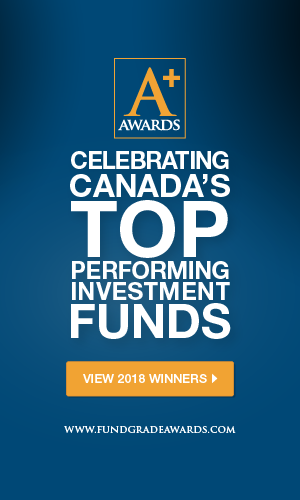 When the new CSA guidelines come into effect on Sept. 1, many funds will be changing risk ratings again, but under the stringent new rules based on 10-year standard deviation, funds shouldn’t be changing categories very often. If a fund you’re holding does change risk ratings, it’s important to look into the reason for the change. If there is no fundamental change to the investment strategy, then it’s likely just a result of the current period of low volatility and not a change in the risks that the fund is exposed to.